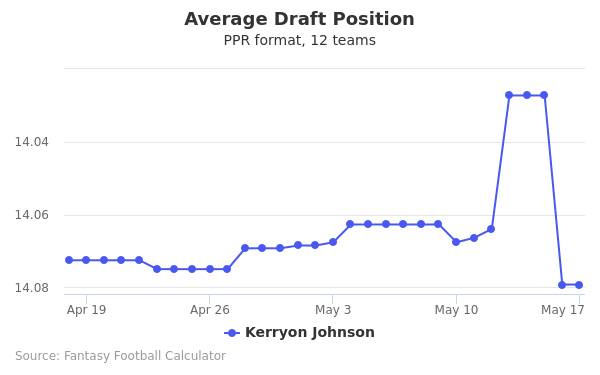 Kerryon Johnson's fantasy value is measured by his average draft position (ADP) in fantasy football mock drafts. In recent drafts, Johnson's current ADP is 4.10, which indicates that his fantasy outlook is to be the 10th pick of the 4th round, and 45th selection overall. 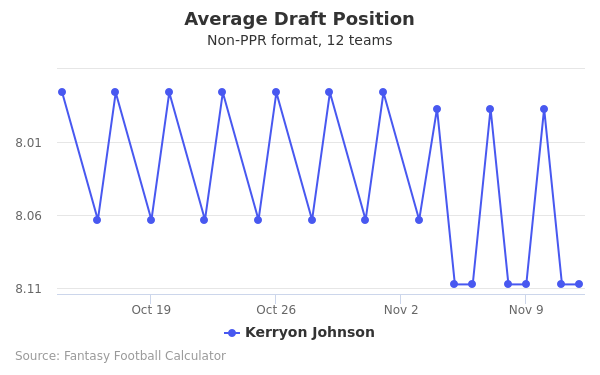 The code below will display a graph that updates every day to show the ADP data for Kerryon Johnson for the past 30 days in 12-team PPR leagues. Draft Cooper Kupp or Kerryon Johnson? Draft Eric Ebron or Kerryon Johnson? Draft Kerryon Johnson or Robert Woods? Draft Julian Edelman or Kerryon Johnson? Draft Kerryon Johnson or Tarik Cohen? Draft Baker Mayfield or Kerryon Johnson? Draft Jarvis Landry or Kerryon Johnson? Draft Alshon Jeffery or Kerryon Johnson? Draft Kerryon Johnson or O.J. Howard? Draft Kerryon Johnson or Tevin Coleman? Draft Kerryon Johnson or Tyler Boyd? Draft Kenyan Drake or Kerryon Johnson? Draft Deshaun Watson or Kerryon Johnson? 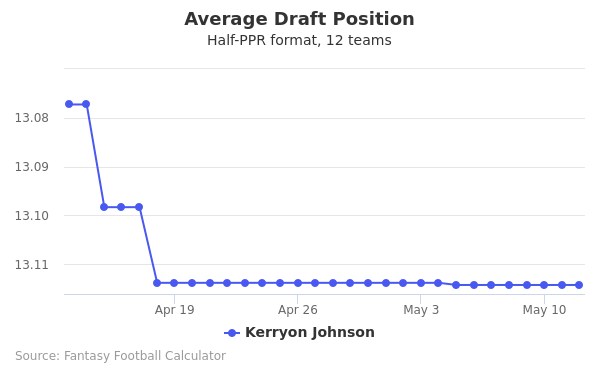 Draft Kerryon Johnson or Will Fuller? Draft Chris Godwin or Kerryon Johnson? Draft Evan Engram or Kerryon Johnson? Draft Calvin Ridley or Kerryon Johnson? Draft James White or Kerryon Johnson? Draft Kerryon Johnson or Mike Williams? Draft Hunter Henry or Kerryon Johnson? Draft Kerryon Johnson or Lamar Miller? Draft Jordan Howard or Kerryon Johnson? Draft Doug Baldwin or Kerryon Johnson? Draft Kerryon Johnson or Russell Wilson? Draft Kerryon Johnson or LeSean McCoy? Start Cooper Kupp or Kerryon Johnson? Start Eric Ebron or Kerryon Johnson? Start Kerryon Johnson or Robert Woods? Start Julian Edelman or Kerryon Johnson? Start Kerryon Johnson or Tarik Cohen? Start Baker Mayfield or Kerryon Johnson? Start Jarvis Landry or Kerryon Johnson? Start Alshon Jeffery or Kerryon Johnson? Start Kerryon Johnson or O.J. Howard? Start Kerryon Johnson or Tevin Coleman? Start Kerryon Johnson or Tyler Boyd? Start Kenyan Drake or Kerryon Johnson? Start Deshaun Watson or Kerryon Johnson? 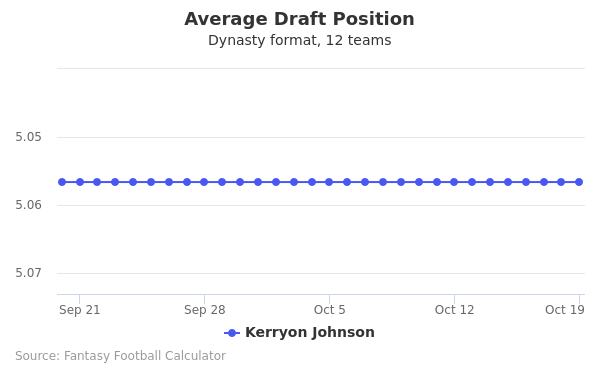 Start Kerryon Johnson or Will Fuller? Start Chris Godwin or Kerryon Johnson? Start Evan Engram or Kerryon Johnson? Start Calvin Ridley or Kerryon Johnson? Start James White or Kerryon Johnson? Start Kerryon Johnson or Mike Williams? Start Hunter Henry or Kerryon Johnson? Start Kerryon Johnson or Lamar Miller? Start Jordan Howard or Kerryon Johnson? Start Doug Baldwin or Kerryon Johnson? Start Kerryon Johnson or Russell Wilson? Start Kerryon Johnson or LeSean McCoy?